It’s that spooky time of year ahead, where the leaves are turning and the world is filled with pumpkin spice. Most of us cherish the fall season, filled with chilly weather, warm drinks and our favorite holidays. 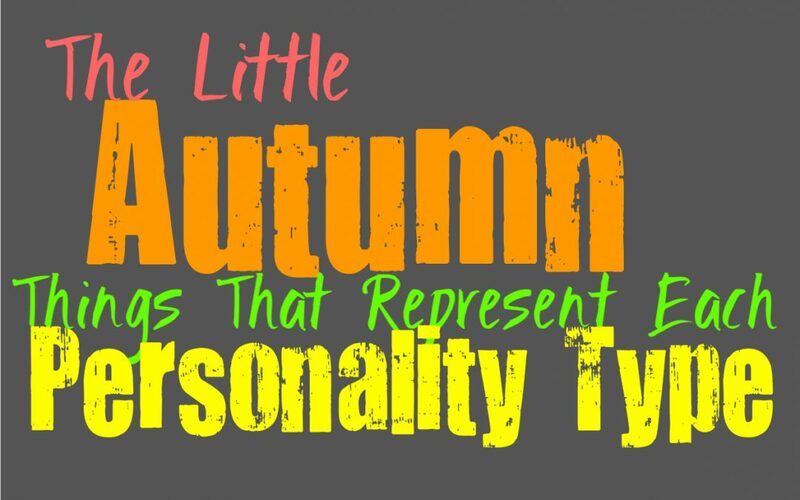 Just for fun, here are a few fall things that remind us of each personality type. INFJs are warm people, with a fiery and passionate spirit, and so they remind us of the cracking fire. Fall means things are getting a bit chilly, which means sitting inside cozied up next to a warm fire. Sitting by the fire enjoying the calm with someone special, is a vision we can easily place INFJs into. Possibly curling up with a book, or simply spending hours enjoying the fire noises and the calm around then. The fire is warm, comforting and yet passionate and even a bit dangerous. This is something that certainly reminds us of the INFJs personality. ENFJs are compassionate and caring people, who do what they can to take care of others. Their sweet yet quirky nature, reminds us of the sweetness of maple candies. They are also unique little treats, ones that have a very special texture which separates them from other candies. The fact that maple candies aren’t just any sugary treat, since they have something different that sets them apart, is certainly something that sounds similar to the ENFJs personality. They are unique people with so much more underneath their layers, but yet they are sweet and giving people. Autumn means chilly nights begin to settle in, which means curling up by the fire. We can picture the INFP enjoying these cooler nights, since it gives them to easy excuse to stay in. Thee cold nights means staying inside and enjoying the time to yourself, possibly reading a good book. There is a comfort in settling into your bed or couch, with your favorite foods and just reading a book or watching your favorite fall-time movies. This feeling of warmth and solitude, is certainly something that reminds us of the quirky and caring INFPs. ENFPs are often trendy, charming and just a bit spicy, and so they remind us of the classic pumpkin spice flavor of fall. During this time of year everyone is rushing to their coffee shops in order to get their favorite pumpkin spice flavors, since it is certainly one of the more iconic and favorite things for this time of year. ENFPs are also charming and likable people, often people find themselves drawn to their warm and vibrant personalities. They perfectly fit the pumpkin spice flavors, which is why we couldn’t pick this little autumn thing for anyone else. There is something about the spicy and yet comforting flavors of apple cider which remind us of the INTJ personality. INTJs are strong-willed people but there is something truly loyal and wonderful about them. While they might have a bit of spice and coldness on the surface of their personality, they are deeply caring and supportive people. Apple cider might have a bit of a kick, but yet it has sweetness to it as well. While the sweet side of the INTJ might take time to uncover, it is still there underneath everything else. ENTJs are classic and entertaining people, who work hard to get what they want. There is something about the spooky Halloween movies which remind us of their personality. Not all of these movies are terrifying, many of them are classics which truly put us in the mood for fall time. ENTJs are great at bringing the right mood to the table and know how to make things happen. Somehow their ability to be efficient and adaptable, reminds us of settling down to a spooky movie to get us into the exact mood we want for fall. INTPs might be logical and introverted people, but they do have a somewhat hip and quirky side to them. This reminds us of chilly fall days spent perusing the farmers markets for the absolute best produce. INTPs often enjoy trying new things and have many surprising layers to their personalities. Just like walking through the farmers market searching through the different options around you. This definitely gets us in the mood for fall and provides us with something wholesome and comforting. ENTPs often enjoy and even seek out change, since they truly despise remaining stagnant. The changing leaves remind us of the ever-changing and growing ENTPs. They enjoy going from one thing to the next, almost entering a metamorphoses like the beautiful fall leaves. They remind us of the vibrancy of the leaves when they turn to their bright fall colors. The colors and the fall change of the leaves definitely have the same vibe as the exciting and charming ENTP personality. ISTJs are loyal and reliable people, and so they remind us of those perfect comfort movies during fall time. There are some chilly nights where all you want to do is settle into your pajamas and watch your favorite comfort movies. There is something truly enjoyable about time spent with a hot drink and your favorite movies. This reminds us of the comforting and dependable personality of the ISTJ. They are supportive people who do whatever they can to provide for their loved ones, much like the things that comfort us in life. ESTJs are strong and dependable people, much like the hardy stews we all enjoy during the chilly fall season. ESTJs do whatever they can to support those around them, and also work hard to get things done. The delicious stews that we all enjoy during the fall season, are comforting and filling. There is something about the nutrition they provide and the comfort we gain from them, that reminds us of the ESTJs personality. Autumn means wearing cozy and oversized sweaters, which reminds us of the ISFJs warm personality. When you are cold you put on your favorite comfy sweater, which is a lot like the comforting and warm personality of the ISFJ. They are always there for their loved ones when they need them, and they do their best to make them happy. This sense of warmth and compassion reminds us of the fall time cozy sweaters that everyone loves. Autumn means that the holidays are upon us, since this is when they are begin. ESFJs remind us of this time of year, since they enjoy traditions very much. ESFJs often love being able to plan for the holidays, and often become sad if they can’t really dive into this time of the year. Their love for traditions and family, definitely makes the holidays the best thing to represent the ESFJ personality type. Not only do they find themselves loving holidays, they also have that sense of family and connection that the season is meant to evoke. ISTPs are often very hands on people, who enjoy figuring things out and creating something new. Their ability to be both creative and logical, somehow reminds us of pumpkin carving. While carving a pumpkin means you have to have some sense of creativity, it also requires the ability to work well with your hands and figure out the best course of action to take. ISTPs are problem solvers, who are very connected to the physical world. Being able to properly carve a pumpkin means being able to be connected to your physical surroundings, which does make us think of the ISTP. Cider donuts have a bit of a spice to them, but they are delicious, sweet and indulgent. This reminds us of the fun and indulgent personality of the ESTP. They aren’t worried about what will happen tomorrow, they are just focused on enjoying the moment. We all know donuts are a bit hazardous to our health and waistline, but let’s face it they are delicious and rewarding. These traits can certainly be compared to the ESTP, since they find themselves soaking up the present a bit too much sometimes and this gets them into a bit of trouble later on. Candy apples are sweet, fun and vibrant, which certainly reminds us of the ISFP personality. They are caring people with romantic hearts, and they enjoy making the most out of the present. ISFPs want to seek out the things that bring them joy, and don’t like being held back by negativity. While candy apples take something healthy and turn it into a guilty pleasure, this is something that reminds us of the playfulness of the ISFP. ESFPs have vibrant and fun personalities, which remind us of the seasons many fireworks. The fall season often brings holidays, parades and fun celebrations. There are often a few fireworks during this time of year, which reminds us of the ESFPs exciting and fun personality. They are bright and exciting people, who enjoy making the most out of every moment. Their truly fun and bright personalities definitely remind us of the fireworks that come with this time of year.